Ever since you can remember, you’ve followed the golden rules for expert oral hygiene, brushing at least twice a day, as well as vigilantly flossing and rinsing. Yet the only thing golden seems to be your yellowing teeth, despite all of your best efforts. Although oral care can go a long way toward maintaining your pearly whites, sometimes you’re fighting a force that can’t be reckoned with: your genes. Here at My Ashburn Dentist, we help our patients in Ashburn, Virginia, who wasn’t as genetically blessed with strong, healthy enamel, fight back against yellowing teeth that do a disservice to their otherwise great smiles. 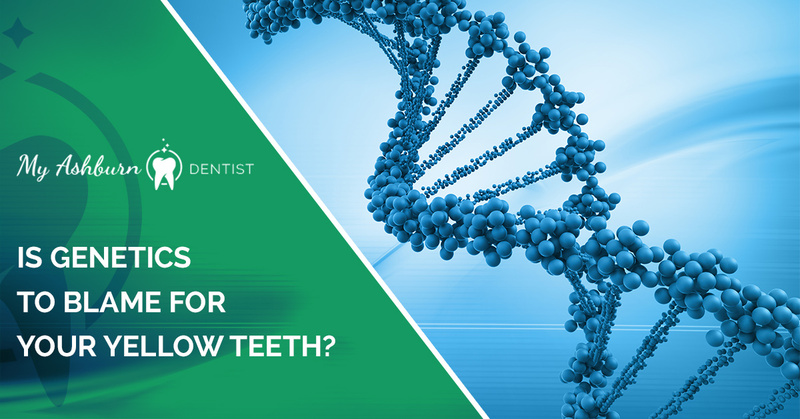 Here’s a look at how your teeth become discolored and the role that genetics plays. And, what you can do about it. Everyone’s teeth eventually begin to discolor over time thanks to the natural wearing down of the protective enamel. The reason for the yellowing effect is that as your enamel breaks down, the brown-colored dentin underneath becomes more apparent. The combined effect of thinning white enamel and the brown dentin inside creates teeth that appear yellow. There are, of course, other factors that contribute to discolored teeth. Take, for example, tobacco use, which can severely stain the enamel on your teeth. Another culprit is beverages like coffee, tea, red wine, and other colorful beverages that leave their mark no matter how often you brush. As well, in today’s world of ever-more processed foods, you might be surprised to learn that many foods contain artificial coloring, from those bright green pickles to the delicious-looking pink salmon filet. In an effort to make their foods more appealing, manufacturers add eye-drawing colors to make their products stand out, even making your butter more yellow. Although everyone wages the same battle against thinning enamel and foods that stain, some people start at a disadvantage because of their genes. In fact, studies suggest that 60% of tooth decay and gum disease is genetic, while 40% boils down to the care (or lack of) you provide. And researchers have gone so far as to identify the gene responsible for your weakened teeth: beta-defensin 1 (DEFB1), which affects the strength of your enamel. A variation in your DEFB1 can cause you to be up to five times more likely to have problems with tooth decay and gum disease than those who don’t carry the same variation. This explains why your friend who never seems to brush or floss, and always has a soda in hand, might still flash a bright, white smile, while you diligently cover your dental bases, but are still left with dull and yellowed teeth. Your enamel is simply thinner, while your friend inherited a strong, thick protective layer. Though it may be helpful to learn why your teeth are yellow, it doesn’t help you figure out what to do about it. And that’s where we come in. We offer a number of solutions that restore your teeth to a whiter, healthier hue, making your smile sparkle. For starters, we offer a laser teeth-whitening system, which we perform in our offices, as well as tray-bleaching options that you can use at home. Both of these whitening treatments are only available to dental professionals, and they’re far more effective and faster than over-the-counter whitening products. If your teeth are severely discolored, we can also cover them with veneers, which are wafer-thin shells that we place over the fronts of your teeth. Once we get your teeth to the color you want, it’s up to you to continue your great oral hygiene, which will help preserve your newly whitened smile. And this includes regular visits for professional cleaning twice a year that deliver a great polish. If you’d like to learn more about why your teeth are yellow and, more importantly, what we can do about it, please give us a call, or use the online scheduling tool on this website to book an appointment.